What is “The Scotch Whisky Industry Review”? 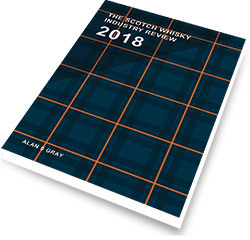 It is the single most authoritative source of business information on the Scotch Whisky industry – incredibly comprehensive in its coverage and painstaking in the accuracy of its research. The Review contains 284 pages packed with fascinating and useful information and is used as a reference by all the leading Scotch Whisky players. How long has the Review been published? The Review is published annually and having started life in 1977 is now in its 41st edition. Who is behind the Review? Every edition of the Review has been compiled by the recognised leading independent industry analyst Alan S Gray. Consumption by market, production, stocks, production costs and profit margins. Names and addresses, list of distilleries (including new and projected ones), distillery capacity utilisation and visitor numbers. The most comprehensive Annual Case Sales figures available anywhere by Scotch Whisky type (Blend & Malt) and by individual Whisky brand. Also a 10 year record for Major Brands. List of Bottled Brands sold in the UK and overseas by company and category - an unrivalled list categorised by standard & deluxe blends and malts. See the brands owned by the different companies at a glance! Information on current sponsorship deals by Scotch Whisky companies. Detailed figures on Scotch Whisky Broking Prices, Excise Duty and Retail Prices of Leading Scotch Whisky Brands. Who should own a copy of “The Scotch Whisky Industry Review”? In fact, anyone with a genuine interest in the Scotch Whisky business! What are the benefits of owning a copy of “The Scotch Whisky Industry Review”? To allow Whisky professionals to determine how their brands and companies are performing as compared to the rest of the industry. To provide an invaluable business reference guide to the Scotch Whisky business. Author: Alan S Gray (Industry Analyst, Chartered Accountant and Master of the Quaich). Published and marketed by Pagoda Scotland Ltd.